Discussion in 'Gear & Equipment Reviews' started by BillySTGK, May 21, 2014. 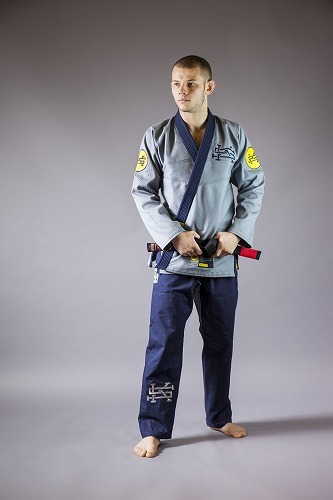 The Rebel gi is completely 110% IBJJF illegal and comprises of a grey jacket with navy blue lapel and pants. The second I saw this gi design I knew I had to have it. The use of logos and colours mixes street style fashion into a gi which has been done perfectly. It's certainly not one for the more traditional gyms and gets a lot of looks but if you are into street fashion and Jiu-Jitsu, like most Scramble gear, this is a MUST have. Not only did I purchase it for it's looks, I also dove head first after seeing the tailor fit slim pants and the tapered sleeves. The Rebel top is 475gsm pearl weave cotton, very light and smooth but has a nice stiff lapel. The sleeves taper down to the wrists and get pretty slim while staying legal. Tapered sleeves and slim arms are something I look for in a gi due to my body type. (Tall and athletic). The reinforcements in the sides of the skirt and the armpits are all sturdy and pretty standard. The pants are '100% cotton superior quality rip stop' (Which also lines the lapel) and fit very slim compared to most pants on the market. They feel extremely strong while staying very light. They slightly taper down to the ankles giving a tailored fit but have a widened crotch using the same material as the gi top giving room to move. At first, I felt a little restricted during stretches because I have always had rather baggy pants but once I got rolling, it wasn't a problem. The pants have 6 loops and a sturdy draw string. I'm 182cm and 76kg (6" and 165lbs) and I went for an A2 which is listed for 170-182cm. I was a little on the fence about this being at the max height for this size after several other gis sleeves shrink to my elbows! But I dropped Matthew Benyon a line and he swore the A2 would fit me well, he wasn't wrong! The gi fits better than any gi I have ever worn by miles. It is such a relief for me to finally find a gi that actually fits. The sleeves are perfect, the chest area is nice and slim, the skirt isn't too short or too long, the pants are slim and tapered yet have room in the crotch to move around and throw up some spider guard. The Rebel comes with a few sewn patches and features some embroidered logos. Both seem extremely durable and high quality. I love the way the yellow pops on the grey jacket. The contrast of the navy embroidered SK (Scramble Kimonos) logo on the jacket and the grey embroidered SK on the pants is also a very nice touch. Some high level thought and design work has gone into this gi. How is the embroidery on the arms? Is it stiff and annoying or soft? It flexes almost as easy as the gi. A lot of embroidered patches have backing behind them making them stiff, these seem to be actually embroidered into the gi it's self making them pretty thin and soft. did your training partners mind you taking pictures in the middle of class? Hi friend! great review, im about the same body type as you, would you say your arms are long? And if you got the chance would you get the A2L instead? or are the arms perfect? Haha, relax guys, coaches taking pics during their classes in Japan is common practice for advertisement of the gym. My students are fine with me taking pics during class and often ask for the photos afterwards, haha. Taking pics in the gym is a big part of the Japanese MMA scene. Hey Blutch, Cheers. My reach is fairly long, I was thinking about going for an A2L but glad I didn't. The sleeves are perfect for me and the pants kind of fit long. I gotta pull them up slightly higher than usual for them to be perfect length. alright this is after washing? thats the bomb, I was thinking of going A2L, or even A3. But i guess i better not and go for the A2, since were pretty much the same height and weight. My previous gi, the hyperfly, A2 got a tad bit too short for my liking in the arms, and particularly pants, after washing. So i hope this will be a lot better. This is after cold washing, hang drying in the sun and training in a couple times. I can't speak for anyone else but for me, the sleeves are 100% perfect and the pants are just slightly long by a few cm but pulling them up a little fixes that. Apparently the A2L only has a few extra cm. But those few extra cm could be critical if your arms are long. With my measurements, I am 100% happy with A2 so far. If you want to be safe, go the A2L and shrink it down if you must. ok great, i actually want the athlete not the rebel (think it looks great but my gym only allows white gi's). But they have the same cut. could you add your wingspan cm? Athlete might be my next gi! My wing span from finger to finger is roughly 186cm. could you keep us postage about shrinkage by the way? 158 wingspan would be too short for me, id be comfortable with 162 at most. since the athlete a2 starts at 166 its a stretch, such a bummer they dont do L sizing on the athlete. Since the Rebel and Athlete have the same cut, I was quite surprised when I saw that an A2 fit you. I have a Scramble Athlete in A2 and it fits me perfect, but I'm 5'7" and 170lbs. Awesome review, Billy! Do you mind if I share it on GiReviews.Net as well? Looks awesome, but I don't want to draw that much attention, especially as a white belt. Thanks and no problem! Please do! Hi, does the A2 still fit you well? or has it shrunk a bit more?